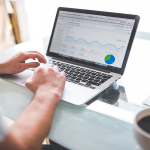 With hundreds of small business accounting software solutions on the market, deciding which software to use for your business can be a bit overwhelming. FreshBooks is known for its stellar invoicing and payment process, and QuickBooks is used by most accountants and bookkeepers. In this article, we compare the pricing and features of FreshBooks versus QuickBooks. QuickBooks is the best accounting software for small businesses because it offers more features than FreshBooks—and at a competitive price. Whether you’re self-employed or a large enterprise, QuickBooks will work at whatever stage you are in the business cycle. Further, QuickBooks has the largest network of professionals to help you with your bookkeeping-related needs. Get your free trial here. FreshBooks is better than QuickBooks if you are a solopreneur, freelancer, or small business owner who needs to track hours worked by employees or contractors. This is because FreshBooks has a better time tracking tool than QuickBooks that can bill clients for time spent on projects. You can also manage multiple businesses with the same account. Get your free trial here. Quiz: Is FreshBooks or QuickBooks Right for You? Do you need to track time spent on projects? Do you invoice a lot of customers? Do you pay most of your bills online or with a check? When looking for an accounting software, there is a list of minimum requirements that most products should include. As part of our research, we looked at cost, ease of use and setup, invoicing capabilities, managing bills, giving other users access to your data, and the customer support options available. After taking both QuickBooks and FreshBooks for a test drive and evaluating their ability to meet the above minimum requirements, we have chosen QuickBooks Online over FreshBooks. While FreshBooks met most of our criteria, it fell short in one key area: ability to manage accounts payable. Staying on top of your cash flow is crucial to business survival. One of the key aspects of monitoring your cash flow is the ability to keep track of what you owe to vendor suppliers (accounts payable). We felt that being able to review an accounts payable aging report to see how much cash is required to meet your obligations was a critical ingredient to success. Accounts payable is included in the mid- and top-tier QuickBooks plans, so they are our top pick. When it comes to pricing, FreshBooks and QuickBooks offer a plan for every budget. The lowest-priced plan for both products is $15 per month, and the highest is $50 per month for FreshBooks Premium and $60 per month for QuickBooks Online Plus. While FreshBooks is known for its ability to streamline the invoicing and payment process, it doesn’t have 1099 contractor reporting, budget/forecasting, and accounts payable, which you will find in QuickBooks Online. The primary difference between the three QuickBooks Online plans are the features included in each. Similar to FreshBooks Lite, QuickBooks Simple Start offers the least amount of features, which is why it is priced at $15 per month. The only difference between the Essentials and Plus plans is that Plus includes inventory tracking, 1099 tracking, budgeting, and forecasting, and Essentials does not. QuickBooks Online Simple Start is ideal for a service-based business with no more than two users. Since QuickBooks Online Simple start has no accounts payable functionality, you will need to pay your bills online or with a credit card no checks. QuickBooks Online Essentials is ideal for a service-based business with no more than five users. Unlike QuickBooks Online Simple Start, you can track accounts payable with Essentials, which means you can enter your bills and print checks directly from QuickBooks to pay them. QuickBooks Online Plus is ideal for a product-based business that needs to track product purchases and sales. Unlike QuickBooks Online Simple Start and Essentials, you can keep track of inventory, 1099 contractor payments, and create budgeting and forecasting reports. While QuickBooks Self-Employed (QBSE) is not included in the table above, it is another online QuickBooks product. QBSE is ideal for self-employed people, such as Uber/Lyft drivers as well as freelancers such as web designers and bookkeepers. It allows you to track your income, expenses, and mileage, and transfer your data to TurboTax to prepare your tax return. Similar to FreshBooks, QuickBooks Online includes the ability to connect your bank and credit card accounts in all of their pricing plans. This will eliminate manually entering this data into your QuickBooks software. In addition, you can reconcile your bank and credit card accounts and generate a bank reconciliation report, whereas FreshBooks does not have a bank reconciliation report. QuickBooks includes full accounts receivable functionality in all of their pricing plans. Similar to FreshBooks, you can create invoices, track customer payments, and generate an accounts receivable aging report in QuickBooks to stay on top of open customer invoices. QuickBooks Online Plus allows you to manage all of your bills. This means that you can enter your bills into QuickBooks and pay them with a credit card, debit card, or check when they become due. As previously mentioned, the ability to run an accounts payable aging report so that you can see what bills are coming due is critical to managing cash flow. Unfortunately, FreshBooks does not offer accounts payable capabilities in any of their pricing plans. Each QuickBooks pricing plan includes two or more users, whereas FreshBooks plans include only one user. QuickBooks Online Simple Start includes one user and one accountant user, QuickBooks Online Essentials includes three users and two accountant users, and QuickBooks Online Plus includes five users and two accountant users. Similar to FreshBooks, you can keep track of the hours employees and contractors spend working on a project so that you can bill your customers later on. The time tracking feature includes the ability to assign a particular activity to a project or customer and choose whether to bill your customers for the activity. While time tracking is not available in the Simple Start plan, it is available in QuickBooks Online Essentials and QuickBooks Online Plus. Unlike FreshBooks, QuickBooks Plus allows you to keep track of payments made to 1099 contractors throughout the year. This is key because you will need to have this information when it’s time to issue 1099 forms, which you can also do in QuickBooks and not FreshBooks. QuickBooks Online Plus is one of the few accounting software programs that includes a budgeting and forecasting tool. FreshBooks does not. After you’ve been in business for a year or two, it’s beneficial to create a budget and start running reports to see how your actuals compare to what you expected to earn (income) and pay (expenses). This can be a critical tool in recognizing trends so you can make the right business decisions. With QuickBooks Online Plus, you can keep track of the cost, quantities, and value of all products that you purchase for resale. This is important because you will always have up-to-date inventory and cost of goods sold figures to help you make informed business decisions. Unfortunately, FreshBooks does not offer inventory tracking in any of its plans. Unlike FreshBooks, QuickBooks has its own payroll service Intuit Online Payroll. Intuit Online Payroll integrates seamlessly with QuickBooks so you can process payroll for your employees (pricing starts at $29 per month). 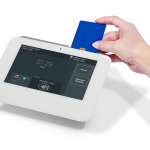 If you want to pay employees using FreshBooks, you will need to purchase Gusto Payroll. Like Intuit Online Payroll, you can calculate paychecks, make direct deposit payments, and pay and file payroll taxes with Gusto. Like payroll processing, QuickBooks also has its own credit card processing service—QuickBooks Payments. You can add this feature to any QuickBooks pricing plan; average fees are between 2.3% and 3.4% plus 25 cents per transaction. FreshBooks allows you to use Stripe or PayPal for credit card processing. The primary difference between the three FreshBooks pricing plans is the features that are included. As you might guess, the Lite plan comes with the least amount of features, which is why it is only $15 per month. However, the Plus and Premium plans are identical with the exception of the number of clients that you can have; Plus allows up to 50 clients and the Premium allows up to 500 clients. The FreshBooks Lite plan is ideal for a service-based business that invoices less than five customers a month. This plan will work if you typically get paid at the same time you provide services, and rarely extend payment terms to customers. Since accounts payable is not available, you will need to pay your bills online or with a credit card. The FreshBooks Plus plan is ideal for a service-based business that needs to invoice no more than 50 customers a month. Similar to the Lite plan, you will need to pay your bills through the online banking service offered through your financial institution or with a credit card. The FreshBooks Premium plan is ideal for a service-based business that needs to invoice 500 or fewer customers monthly. Similar to the Lite and Premium plans, you will need to keep track of your unpaid bills outside of FreshBooks, since there is no accounts payable functionality. Like QuickBooks, FreshBooks allows you to connect an unlimited number of bank and credit card accounts. While this will save you a ton of time by eliminating manual data entry, you will have to manually reconcile your bank and credit card accounts. To assist you, we have created a bank reconciliation guide that gives you detailed instructions on how to create a bank reconciliation report. FreshBooks accounting software is known for its custom invoicing capabilities. You can choose an invoice template and customize it by adding your company logo, brand colors, and any fields and columns that you need. In addition, you can track customer payments and run an accounts receivable aging report to stay on top of unpaid customer invoices. Unlike QuickBooks, FreshBooks does not have accounts payable. Therefore, you cannot keep track of your unpaid bills in FreshBooks. However, you can download paid bills by connecting your bank and credit card accounts to FreshBooks. All FreshBooks plans include one user, whereas at least two users are included in every QuickBooks Online plan. To add additional users to any FreshBooks plan, you will need to pay an additional $10 per user per month. One of my favorite features in FreshBooks is the time tracking feature. This feature is available in all three pricing plans, and it is much more robust than time tracking in QuickBooks. You can track time manually or use the timer. It also allows you to invite employees, contractors, and clients who need to track their time, and it has detailed reports that you can run by project, client, or employee/contractor to keep tabs on the progress of each project. FreshBooks will automatically send payment reminders to notify your customers that an invoice is either coming due or past due. Payment reminders can be scheduled to go out before an invoice is due, after it is due, or both. Unfortunately, this is a feature that QuickBooks Online Plus does not offer. FreshBooks allows you to set up multiple businesses under the same account. This means that you can access all of your businesses using one sign-in and just toggle between businesses as needed. Each new business will be eligible for a free 30-day trial and subject to the current pricing after the trial ends. Unfortunately, you can only access one business per QuickBooks account. Unlike QuickBooks, you cannot keep track of payments made to contractors in FreshBooks. You will need to manually keep track of these payments outside of FreshBooks so that you can include them on your 1099 forms at the end of the year. FreshBooks does not include a budgeting and forecasting tool like QuickBooks. Therefore, if you need to do budgeting and forecasting, you should choose QuickBooks Online Plus. QuickBooks Online Plus will allow you to create budgets for customers, jobs, and for all income and expense accounts. As mentioned previously, FreshBooks does not have the ability to track inventory. Therefore, it is not ideal for a product-based business. If you need to track inventory, you should choose QuickBooks Online Plus, which will allow you to track all product purchases and sales for your business. While FreshBooks doesn’t offer its own payroll service like QuickBooks does, you can visit the FreshBooks Apps center and sign up for Gusto Payroll. Gusto will calculate payroll checks, process direct deposit payments, and pay and file payroll tax payments. Similar to QuickBooks, you can accept online payments with FreshBooks. Stripe integrates seamlessly with FreshBooks so your customers can pay their invoices online. Visit the FreshBooks Apps center to connect your existing payment account or to create a new one. Both FreshBooks and QuickBooks have a very user-friendly interface. They both use simple language throughout the program so anyone without an accounting/bookkeeping background can use the software. Let’s take a look at the dashboard of each to give you a better understanding. 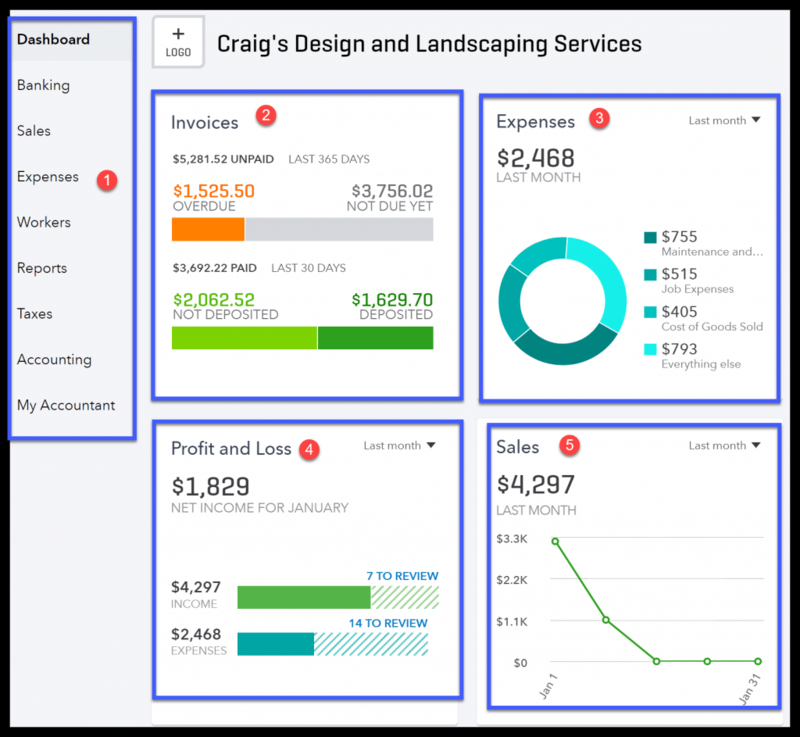 The QuickBooks Online dashboard is divided into five main sections: left menu bar, outstanding invoices, total expenses, profit and loss, and sales. You can easily navigate to different areas of the program using the left menu bar. Instead of running a report, you can see your paid and unpaid invoices, total expenses, profit and loss, and total sales for any period of time. Left Menu Bar – Similar to FreshBooks, you can access just about any task from the left menu bar, including create invoices, bank accounts, and reports. Invoice – In this section, you can see the amount your customers owe you (accounts receivable), as well as the total amount of payments collected that you have deposited versus undeposited funds. Expenses – See the total expenses for a selected time period along with the top three categories (e.g., Maintenance and Repairs, Job Expenses, Cost of Goods Sold). Profit and Loss – Similar to FreshBooks, keep tabs on your profit/loss without having to run a report! Sales – Keep an eye on your sales throughout the month and year so that you can spot trends and make adjustments as needed. Like QuickBooks, the FreshBooks dashboard provides you with key information such as your accounts receivable balance, total profit, and a left menu bar for easy navigation within the program. Left Menu Bar – Like QuickBooks Online, you can perform most tasks from the left menu bar; such as create invoices, enter expenses, and create new projects. Create New – Click the drop-down button and you can easily create new invoices, expenses, or enter time spent on a project. Outstanding Revenue – Stay on top of customer invoices that have not been paid. The color-coded bar indicates overdue invoices (in red) versus invoices that have not come due (in yellow). Total Profit – Keep tabs on your bottom line without having to run a report! 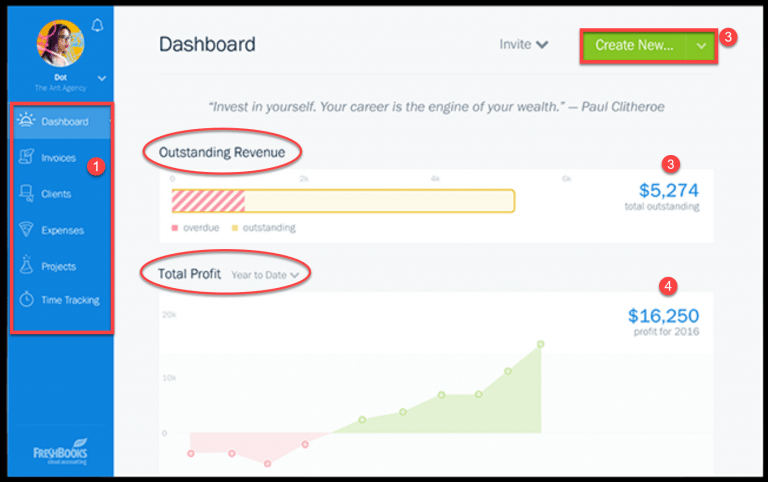 You can change the time frame to see your profit on a monthly, quarterly, or annual basis. Having the ability to get help when you need it is key. Both FreshBooks and QuickBooks offer a number of support channels that you can easily access. The best part is that unlimited support is already included in your monthly plan. With QuickBooks, you can speak with a support rep via telephone. Unlike FreshBooks, QuickBooks also has a chat feature. You can access the link to start a chat directly from within your QuickBooks account. You can also search for your question on the QuickBooks learn and support page, which includes articles, how to videos, and FAQs. FreshBooks allows you to talk to a human (this is literally on their website), email them, or you can access their extensive FAQ section with detailed instructions on how to do almost anything in FreshBooks! You can also send an email to help@freshbooks.com. Both FreshBooks and QuickBooks integrate with hundreds of software programs. For example, if you have complicated inventory needs (that neither FreshBooks nor QuickBooks can meet), you can visit the app center to locate a service that works with either provider. QuickBooks integrates with over 600 software programs. Gusto, Stripe, PayPal, Shopify, and Square are just a few of the apps that integrate with QuickBooks Online. Unlike FreshBooks, QuickBooks has built-in payroll and credit card processing features. When you are ready to hire that first employee or accept online payments from customers, you simply turn that feature on—no app required but additional fees may apply. Be sure to check out the complete list of apps. FreshBooks integrates with more than 70 software programs, such as Gusto for payroll, Stripe and PayPal for credit card processing, and Shopify and Square for ecommerce, just to name a few. Be sure to check out the FreshBooks integrations page for the full line up. QuickBooks Capital is a lending solution available to small business owners who use QuickBooks. In a little over its first year of existence, they have funded $200 million in cumulative loans to small businesses by leveraging leading-edge data science to create a breakthrough credit model. At the writing of this article, FreshBooks did not offer any lending solutions. QuickBooks Capital provides loans to small business owners who use QuickBooks to do their bookkeeping. Small businesses can apply for loans up to $100,000 with terms up to 12 months. Unlike traditional lenders, Intuit has access to their customers’ data, which gives them insights into open invoices, cash flow forecasts, sales trends, and profitability over time. With this information, QuickBooks is able to customize a loan to meet the individual needs of a small business. To apply for a loan through QuickBooks Capital, you must be pre-qualified. Log into your QuickBooks file to see if you have an invitation to apply for a QuickBooks Capital loan. It only takes a few minutes to apply, since most of the information is transferred from your QuickBooks file to the application. Generally, you can expect a decision within two to three business days, and funding takes place within 48 hours of approval. 90% of QuickBooks Capital customers said the funds they received helped them to grow their business. 41% of QuickBooks Capital customers said that without a loan from QuickBooks Capital, they would not have expanded or improved their business. Unlike QuickBooks, FreshBooks does not currently offer a lending solution to small businesses. Overall, both FreshBooks and QuickBooks have pretty decent customer reviews. Customers like how well the QuickBooks mobile app works, but feel the customer service could use improvement. FreshBooks customers like how streamlined the invoicing and payment process is, but feel like the program lacks key features you would expect in an accounting program. On the positive side, QuickBooks customers said that the app works very well on all mobile devices; on the negative side, customers feel that the customer service team is inefficient and unreliable at times. As a QuickBooks ProAdvisor, I must agree that whenever I have called the support line, it is hit or miss as to whether the rep will be able to answer my question. I’ve had the most success with the chat support team. Check out our QuickBooks Online customer review page to learn more about what small businesses are saying about QuickBooks. On the positive side, FreshBooks customers said that the invoicing and payment processing features work well for small businesses. On the negative side, customers feel that the program lacks some features that a small business accounting software should have, such as financial statement generation and bank reconciliation. Check out our FreshBooks customer review page to learn more about what small businesses are saying about FreshBooks. If you just can’t afford to buy accounting software but you need a better way to track your income and expenses, try Wave. Wave is a free accounting software that you can use to manage accounts receivable, accounts payable, connect your bank and credit card accounts, and run detailed financial reports. You can read our in-depth review of Wave versus FreshBooks or visit their website to sign up for your free account. Now that we have compared the pricing and features of FreshBooks versus QuickBooks, it’s time for you to make a decision. If you want an accounting software that gives you the most bang for your buck, go with QuickBooks. You can manage every financial aspect of your business and have up-to-date financial statements anytime you need them. You can take QuickBooks for a test drive, risk free. You just need to head over to their website and provide a few basic contact details to get started. There is no credit card required and you have access to all of the features we have discussed during the free 30-day trial. This is probably the best guide I’ve come across 1) because it covers all the features and answers all the relevant questions, and 2) it focuses on 2 of the best products out there. It did get a little overwhelming when we were first deciding on what platform to use. An simple to use accounting solution is a must if you are looking to keep track of your finances! Hey Moz, I’m glad you liked our FreshBooks vs QuickBooks guide. Thanks so much for the positive feedback!